State Rep. La Shawn Ford made it official Nov. 8th: He's running for mayor of Chicago. Candidates running for mayor and the Chicago City Council will begin filing their petitions on Monday. State Rep. La Shawn Ford, who officially announced his bid for mayor last week, needs to collect at least 12,500 signatures, as do the other mayoral candidates. Aldermanic candidates are required to collect several hundred signatures. All candidates have one week – until Nov. 26 – to turn in their petitions to get on the Feb. 26, 2019, ballot. The state lawmaker’s “Ford for Chicago” campaign office has opened at 5850 W. North Ave. To celebrate the official opening of his headquarters, Ford will be holding a petition party from 2 to 6 p.m. Sunday, Nov. 18th. Admission is free, though invitees are asked to bring at least one completed petition sheet with them. Another West Sider – Amara Enyia, executive director of the Austin Chamber of Commerce – will be hosting her own petition return party this weekend. It will be held from 4 to 8 p.m. Nov. 18th at Blue Lacuna, 2150 S. Canalport Ave. To gain admission, bring in petitions or sign a petition. 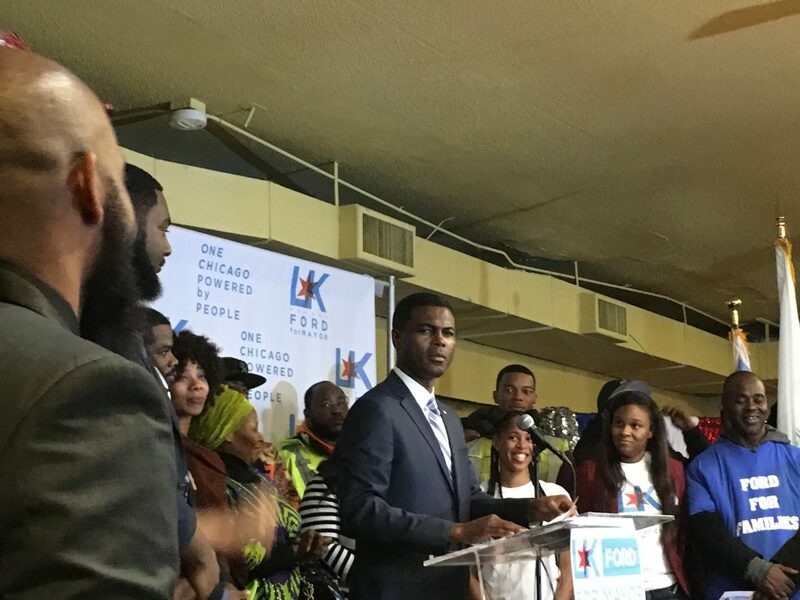 Ford announced on Nov. 8th that he’s joining more than a dozen other confirmed candidates in the race for mayor at Sankofa Cultural Arts & Business Center, 5820 W. Chicago Ave.
“This is what One Chicago feels like: powered by people,” Ford said at his official announcement, which was attended by a few hundred people. Ford said his experience serving on the Illinois House Appropriations Committee and passing state laws is what separates him from the other candidates. Ford, who’s represented the 8th District for 12 years, graduated from Loyola University and has worked in real estate. He said he has governed with a social justice lens and his platform emphasizes how to make Chicago more financially stable, and become safer and healthier. To improve Chicago’s finances, Ford said taxpayer dollars need to be spent less recklessly, citing the $1,552,346,776 recommended budget in 2018 for the Chicago Police Department. He said educating youth at either a trade school or in college would make them fiscally independent. Creating a flourishing and job-filled market would then make the city safer, he added. 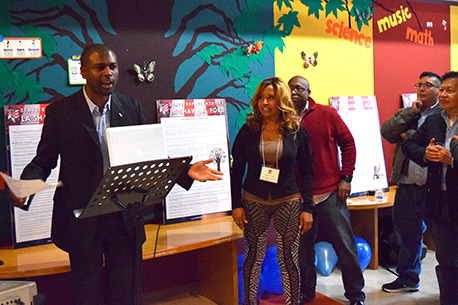 Then, paired with community investment, areas like Austin would see a drop in violence. To create healthier communities, Ford said there needs to be better access to produce as well as mental health services. Ford has helped pass legislation in support of making farmers markets and fresh produce more accessible to communities that are typically underserved. Nakisha Hobbs, a Ford supporter, asked for volunteers for the campaign to come up on stage at the event, then filling it with supporters. She said Ford’s campaign represents a true grassroots campaign, with community members getting signatures for his petition and informing people about Ford’s platform. Rep. La Shawn Ford is seeking a sixth term in the Illinois House of Representatives. Longtime West Side resident Valerie F. Leonard has three wishes for Chicago's new mayor, Lori Lightfoot.